Oh how I've longed to eat ravioli but only had the choice of paying $18 at one of my favorite vegan restaurants called Fatty's Cafe. I heard of people using wonton wrappers to make ravioli but all the one's I've found contained egg, so that was not an option. I knew another choice was to make my own pasta noodles but one of my aunts freaked me out earlier this year, telling me that one of the hardest things to make was pasta noodles. So because of this I never attempted to make it, in fear that it would be a disaster. Well last week I was reading a post from one of my favorite bloggers over at The Witchy Kitchen and I saw that she made ravioli. Something sparked in me after reading her post and I knew I just had to concur this fear I had with pasta noodle making. P.S. I hope everyone has a fun and safe Halloween tomorrow. If you own a black cat, I urge you to keep him indoors for the night. I've heard that people like to kidnap black cats on Halloween, so please make sure your kitty is safe. 1. 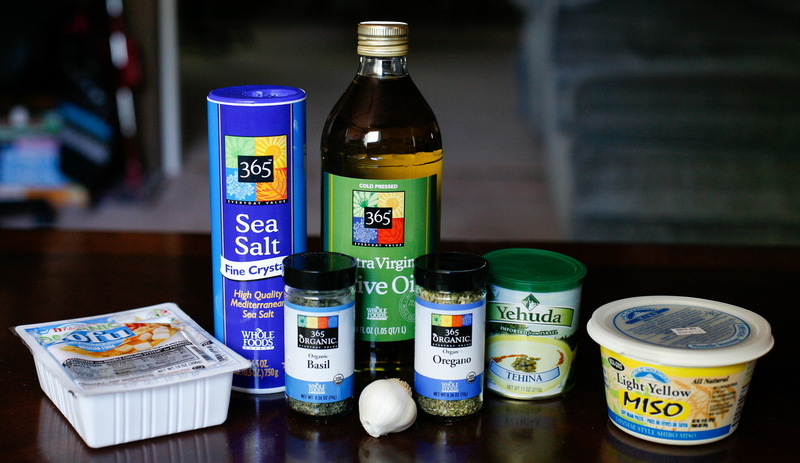 Mix all ingredients together, either in a bread making or a large bowl. If doing by hand, knead the dough for about 8 minutes, adding more flour if sticky or more water if the dough won't hold together well. 2. Once you have kneaded it into a smooth ball, cover with plastic wrap in a slightly greased bowl and let rest for 30 minutes. 3. 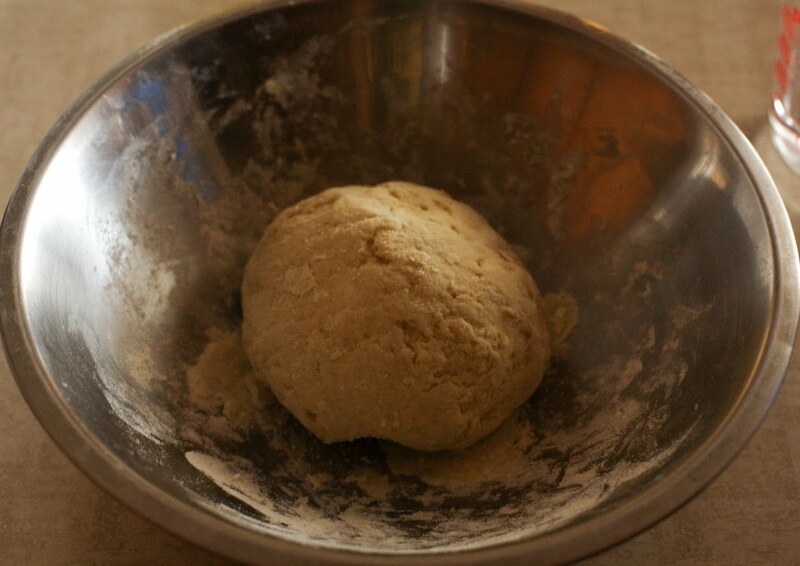 Once your dough has rested, divide it in half or in quarters, for easier rolling and begin to roll each piece on a well floured surface. Continue rolling until it is about 1/8 inch thick. Once all the dough is rolled out, its time to start assembling them. You can go about this several different ways. 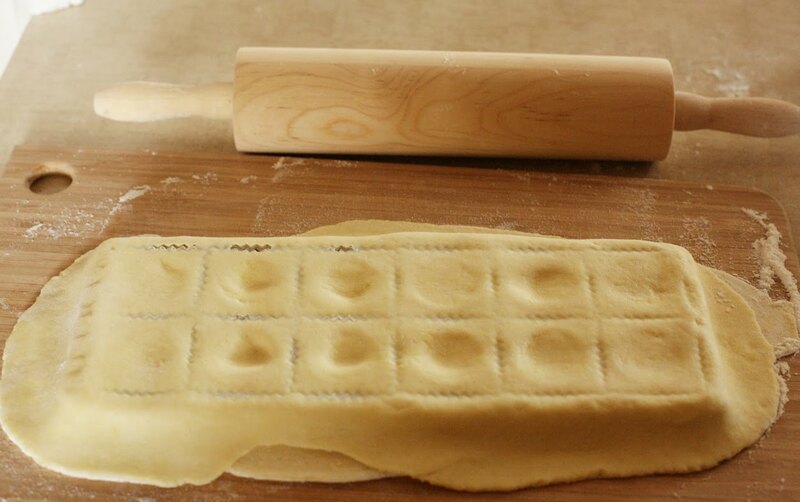 The first way would be to lay out one sheet of pasta and place about 1/2 tsp of filling, two inches apart. 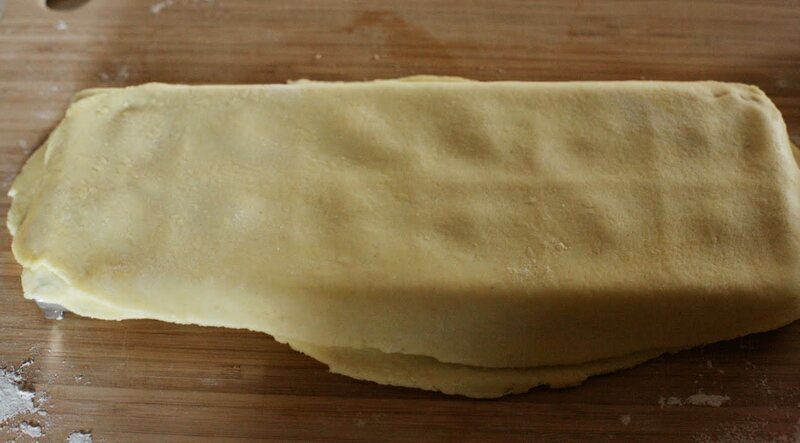 Then place another sheet of pasta on top and press down around the outside edges of the dough, to seal. Cut out each ravioli using a ravioli cutter or a pastry wheel. 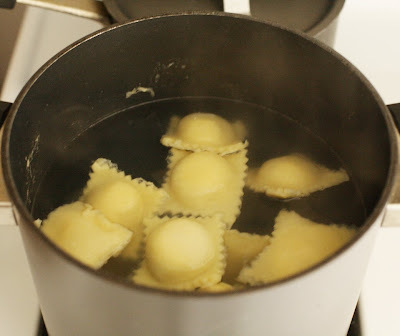 The second way would be to cheat and use a ravioli maker (I use this one).You basically do the same as above but using one of these helps to get each ravioli to the exact same size. 4. Place one piece of dough and fill each ravioli with ricotta. 5. Place the top layer over the bottom layer. 6. 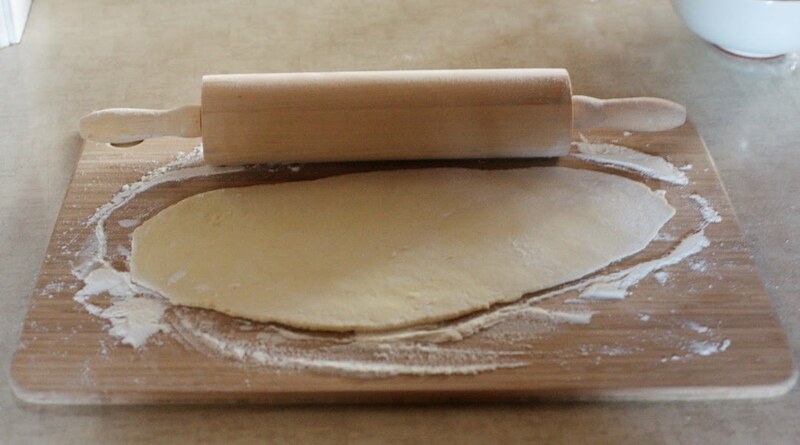 Press and seal the outside edges of the dough, using your fingers. Roll across the top dough to cut out. 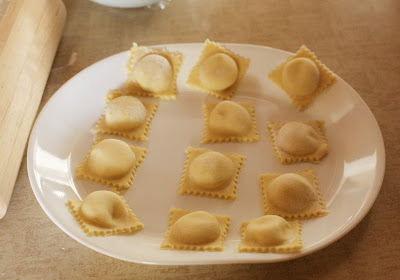 Make sure to keep each ravioli separate from the others because if they touch they will stick like crazy. 7. Once done, place in a pot of boiling water and cook until al dente, 7-10 minutes. Remove and drain well. To Serve - Place in a large bowl and add the marinara sauce. Divide the raviolis among four plates. 1. 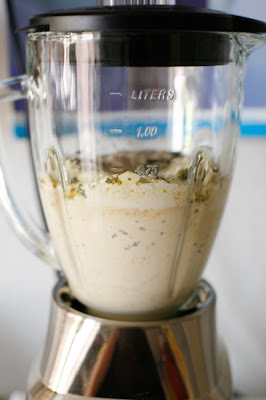 Blend all the ingredients in a food processor until smooth. The cheese will keep for 2 days, covered and refrigerated. you must have read my mind!!!! I was looking all over cyberspace for a Vegan ravioli recipe! Its already on the menu for next week. They look great! Those look so pillowy perfect! 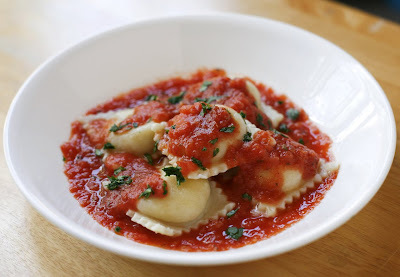 I love ravioli...and I'd def pay 18 bucks for a bowl of yours! Really beautiful, Jacklyn. Oh, and Happy Halloween! Jessica - Let me know how they turned out! I ended up making two batches of the recipe because they were just so darn good! Kat - it is! all you need is patience and time..you should try! Your ravioli looks so mouthwatering. I love Stella's blog too, she is also one of my favorite bloggers. I'm sorry to write this here but I also need to hear from you on your submission to my YBR event. I didn't receive a reply to my email. But if you are still participating I need you to email me your information, otherwise I have to delete your Linky entry. Thanks and I look forward to receiving your info. What a great looking first attempt! 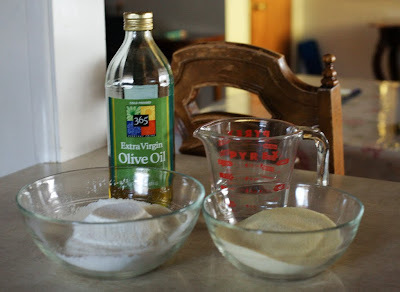 I am still working on making my own pasta dough and it's getting easier now that I've done it about five times. 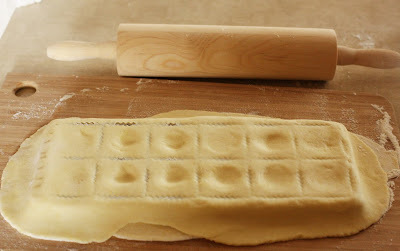 The ravioli press looks like the key here to beautiful ravioli! Next time I try, I'll follow your step by step. 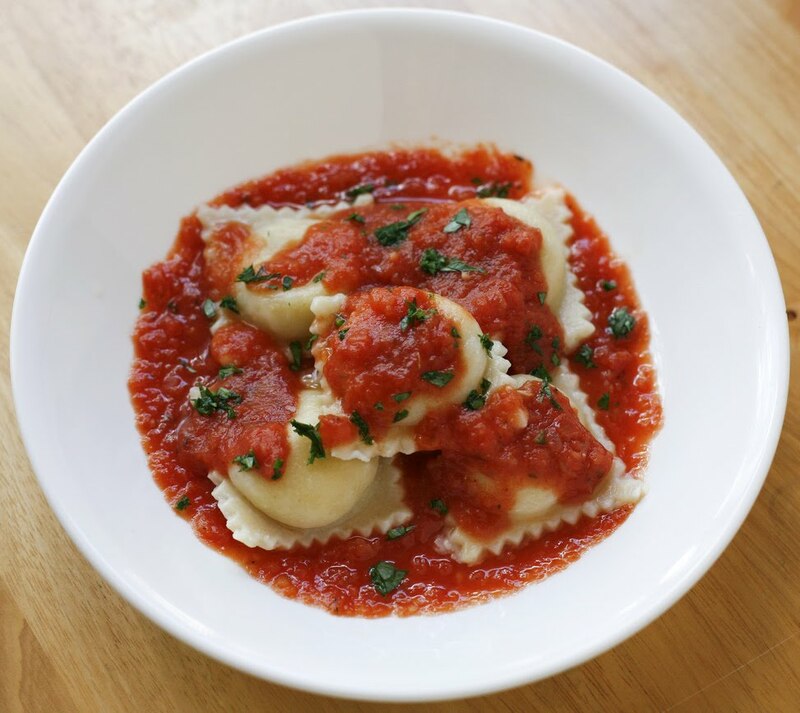 Your homemade ravioli look fantastic. So plump and full of flavour. Thanks for this awesome recipe - can't wait to try it! Yours look so much better than mine...beautiful dish. Tami - Let me know how it turns out when you do! Tender Branson - The key was the ravioli maker..without that mine wouldn't have turned out so perfect looking. I very good investment at under $30. Cool, you make your own pasta! Most of the blogs I found online buys pasta. I'll be making this recipe this weekend because my dad is coming after a year in other country. Thanks for posting this amazing recipe! Just made these tonight. They're awesome! The dough was very easy to work with. Highly recommended. Can you freeze this ravioli, without the sauce ofcourse? Hi.. I tried making it but my ravioli opened up while boiling. I had made a stiff dough, which was cracking a little may be I should have used more water or lesser semolina. What do you think would have helped. Also, I mixed some corn with ricotta. Do you think the heavyness would have opened the ravioli ? We just made this and it was fantastic! 10/10. Had a bunch of non vegans over and they were super impressed. My boyfriend has declared this the best food he's ever eaten, ever in the history of food. 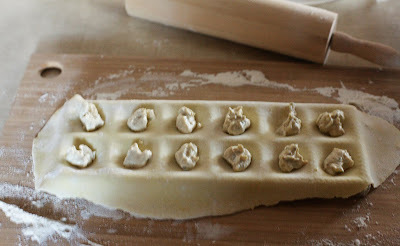 I'm cheap and last minute, so I opted for an ice cube tray as a mold for my ravioli, and it works really well -- I seal the edges, then turn it out onto the counter, slice them apart and crimp with a fork. Thanks for the recipe and the encouragement to try pasta making!